alaTest has collected and analyzed 460 reviews of Insignia Flex 10.1 (NS-14T004). The average rating for this product is 4.1/5, compared to an average rating of 4.5/5 for other products in the same category for all reviews. Comments about the size and screen are overall positive. The performance and usability are also appreciated, whereas some have doubts about the touch screen. We analyzed user and expert ratings, product age and more factors. Compared to other products in the same category the Insignia Flex 10.1 (NS-14T004) is awarded an overall alaScore™ of 85/100 = Very good quality. If you're looking for a large-screen Android tablet that will let you browse the Web, watch movies, and play a few games, the Insignia Flex 10.1 is a great deal—just don't push it too hard. Solid value. Bright IPS display. Smooth Web browsing. Micro HDMI port and microSD card slot. Miracast support. Older hardware will struggle with more intense games. Button placement could be better. 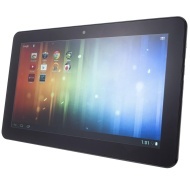 For the size this tablet has awesome graphics and audio playback. Lots of Great Features. This Tab Has Also Has The Current Features. Durable and easy to use for my 6 year old son. Only problem we have had is that a few times it seems to freeze and not turn on with just the press of the start button. Not sure what happens, it takes a moment then it will turn on. Got this for my 10 year old grandson. He loves the games he can play on it. Keeps him occupied on long trips. Highly recommend it. Great product and easy to use- very recomomended! Great memory and holding space as well. If you are looking just for something to browse the Web or for a younger student this a good buy for the smaller budget.